The added width and volume of the 5 Square eliminates ground faults and short circuits by doing away with pinch points and overcrowding of the appliance and conductors, subsequently eliminating associated troubleshooting time. 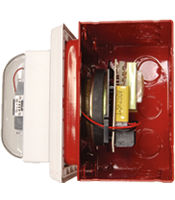 The first fire alarm signal backbox created explicitly for flush mounting of fire alarm signals. The added width and volume significantly reduces stress on the appliance terminals resulting in fewer damaged appliances. The added room around the appliance also tends to reduce the need to train conductors away from the appliance; speeding installation time. Cooper Wheelock allows the 5 Square products to contain a full complement of conductors per NEC Table 314.16(B). Manufacturers realize that smaller boxes tend to create ground faults and short circuits and can damage their products. Other boxes may only contain the number of conductors that terminate on the appliance per manufacturers’ requirements. The benefit of this added volume and full complement of conductors is additional circuits and zones may be pulled through the 5 Square which in turn may reduce conduit. The 5 Square x 4 square plaster ring mounting holes are precisely stamped and tapped, which allows for quick and easy installation of the appliance. Typical 4 square box extensions have folded screw tabs for mounting appliances and tend to be slightly out of square which can cause screw centers to be off slightly. The impact of this when mounting an appliance to an extension box is the first screw goes in straight, but the second screw may end up at an angle causing the installer to force the screw to cut new threads. Many times this causes the screwdriver tip to slip while under pressure and can easily gouge or scratch the appliance and/or wall. The physical size of the box makes wire pulling much easier as well as saves knuckles from being skinned and cut as much. Start-up is much quicker and easier, especially at the end of projects when crunch time occurs and troubleshooting ground faults and short circuits is no longer a major issue.